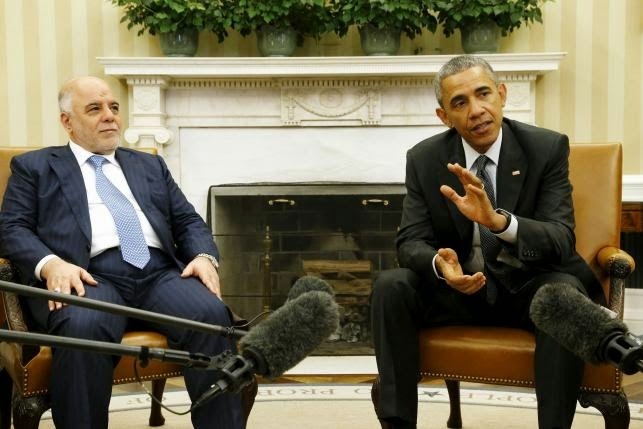 Iraqi Prime Minister Haider al-Abadi today met with President Obama at the White House. An Iraqi official told CNN after the meeting that the prime minister made a request to Obama for enhanced U.S. military support, including increased airstrikes against ISIL positions. The Iraqi official pointed to recent ISIL attacks on the Baiji oil refinery as a reason for boosting U.S.-Iraqi military cooperation. “If we can enhance the current cooperation, then we can avoid these sorts of attack,” the official told CNN. Asked by reporters about Iraqi requests to enhance military cooperation and purchase more military equipment, like helicopters and drones, Obama said that the reason for the meeting today was to discuss such issues. Aside from military cooperation, the prime minister also requested joint efforts on areas like economic development opportunities in Iraq. Also, the White House announced that the U.S. has offered Iraq $200 million for urgent humanitarian projects. The Iraqi PM is also asking for deferred payment on military-related purchases. Wondering if F-16 deliveries were brought up.